Why do you need a CRON Job? Where do i set up my CRON Jobs? What tasks do i set up in my CRON Jobs? Which "thePHPfactory" Extensions need Cron jobs? What job should be executed for a specific Extension? How to run CRON even if your host does not support it. Most of our extensions have the required information available in the administrator backend, and also the required links. You can check individual documentation or the component control panel for links, password setup and other details. If still having trouble, continue with this article or use our forum. CRON is a service provided by most hosting solutions – including Godaddy, Dreamhost, Hostgator, etc… that allows you to run scheduled jobs that perform regular cleanups, backups or other scripts that need to run from time to time. PHP is running only when users are visiting your site. You have no guarantee that at a specific time there will be an instance of PHP running on your web server. This is why you have to ensure this through running at specific times the needed PHP script. CRON jobs are tasks that run at scheduled times, where usually this is a service offered by the hosting provider. These tasks make sure that certain extension tasks run at a specific time. This way you make sure that for instance your users get the notifications about upcoming expiring auctions or information regarding their watchlists. CRON jobs are required to keep an extension working properly. For detailed information about what each component needs a CRON for, check the detailed link at the bottom of this article. Setting up the CRON jobs might be different from one solution to another, since this depends allot on the service provider. Here we advise to check out our references and match them to the ones provided by your hosting provider or other 3rd party which is offering the CRON service. Common task that may run every 5-15 minutes, that closes current expiring auctions and notifies winners/auctioneers. Our recommendation is to set up the common at a 5 minutes pace and the daily at midnight. You can set up / change the password for the CRON jobs in Settings - General Settings, first tab - CRON Settings area. 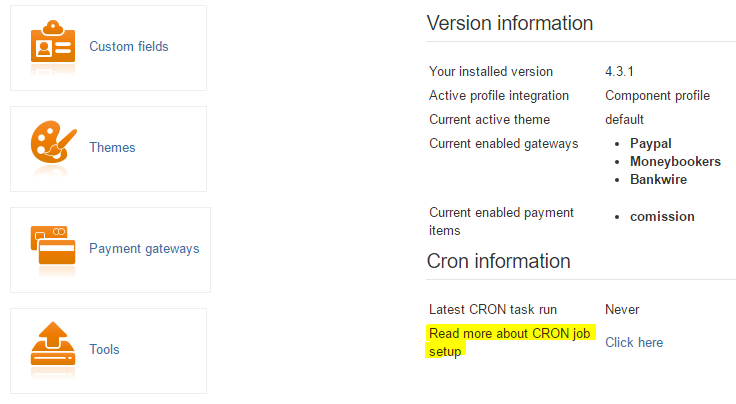 Detailed CRON information for all our extension can be found at this link. That depends on several factors: does your hosting service allow lynx, curl or wget to be executed in CRON? If not, then you can execute the PHP script directly with the php binaries. At least one of these three options must be enabled for you in your hosting. If none works, then you should ask your hosting provider to enable at least one of it, since it’s a common practice for websites to use these techniques. Several extensions need two types of jobs – Daily and every 5-10 minutes. The daily job checks actions that have to be triggered at midnight (for instance auction expiring). The normal job will check the current environment and act accordingly (for instance check for expired items and close them). For Daily jobs you have to append &daily=1 to the URL. Below is the list of CRON Jobs using lynx, curl or wget. If your hosting allows only direct PHP call then read the next section. You must use just ONE of the three calls sampled here. We included all three types of calls in order to cover all types of hosting. Note that some hosts may require additional parameters in the CRON job in order for the job to run. For example, a user agent specification is required in certain mod_security implementations. Consult their documentation or contact the host directly for such cases, since they know best regarding this. Now with the BAT file created you must set an windows task scheduler to run your created BAT at specified time. Users that have hostings that do not allow execution of curl, wget or lynx will have to execute the PHP directly as a command line. Most times the php interpreter is in the search path of the hosting, so you do not have to prefix the PHP with its path. Mostly php is located in /usr/bin or in /usr/local/bin. In order to execute a php script you should write for instance: /usr/bin/php [path-to-the-script]/script.php To be more specific you can check the following list. You have to know the installation path of your joomla site (not the URL! It has to be something like /home/myhosting/public_html/joomla ). The &daily=1 parameter can also be used. There is a cheap and simple way to have a CRON job running when your hosting does not support it. You can use Google Scripts from your Google Drive. For instance you can create an empty Google Drive document called "My Auction Factory CRON". Then go to "Tools / Script Editor" menu, it will open a new editor window. You can get the extension name from any link within that respective extension, it is usually something like "com_auctionfactory" or "com_adsfactory". Then save the script and run it once. It will ask you for permissions that you have to allow. Then set up the Schedule by clicking the menu "Resources / All your Triggers"
If the CRON does not seem to work, please try to find in your hosting help, or ask support if they support these calls. A detailed tutorial regarding CRON jobs in general is available here: https://drupal.org/node/23714 - even if written for Drupal, most of it is CRON specific.